Abbasid. Al-Mustasir. AD 1226 to 1242. Copper Dirhem. I have not attempted to read the date or mint on this coin, and assume both the date and mint are off the flan. Reference : Album-274 (listed as a Fals). Size : 25.4 x 26.9 mm. Weight : 8.72 grams. Grade : VF but areas of orange encrustations, some of which probably have corrosion below them. 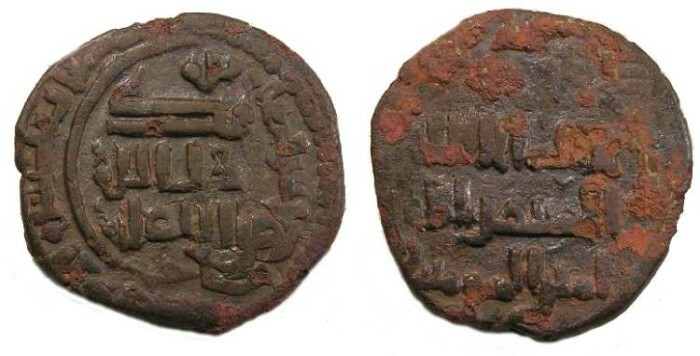 Obverse : Arabic inscription which if fully on the flan would read al-imam la ilah illa Allah al-Mustansir billah amir al-muminin. Reverse : Arabic inscription which if fully on the flan would read lillah Muhammad rassul Allah salla Allah �alaihi, with the date and mint around.